A soldier stands guard next to Tutankhamen's gold mask inside the Egyptian Museum on Feb. 16. 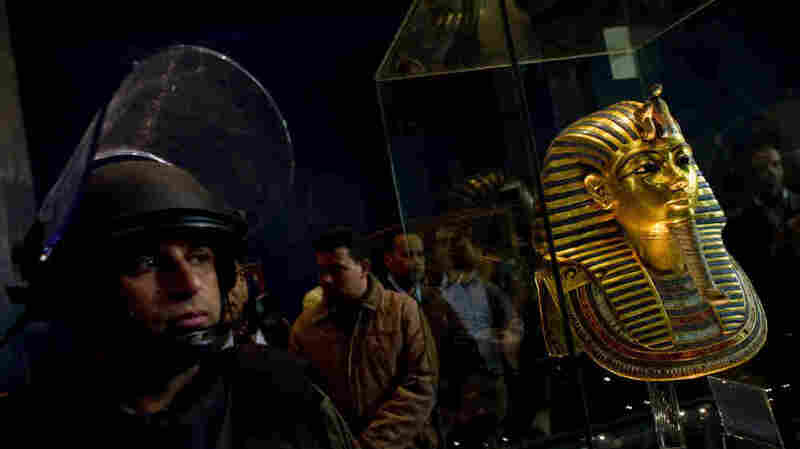 Looters broke into the museum in Cairo's Tahrir Square in late January. Among the casualties of Egypt's revolution are many of its famous historical sites and artifacts. Vandalism and looting at these sites skyrocketed in the weeks after the Egyptian police force — including those responsible for tourism and antiquities — vanished from their posts. Even now, as the security forces resume their duties, archaeologists and experts complain that far more needs to be done by Egypt's new government to protect the country's heritage. Cairo's famed Egyptian Museum suffered some of the worst damage. It is home to famous ancient Egyptian artifacts like the golden mask of the boy King Tutankhamen. This heritage should be protected by everyone in Egypt and outside Egypt because this is for the whole world. It's the heritage of mankind. Tourists, who are slowly returning, see few signs of the damage and looting that took place at the museum in late January. But the museum's deputy director, Mahmoud el Halwagi, says it feels like it happened yesterday. The veteran curator cringes when he recounts the events. The ruling party's headquarters next door was set ablaze. Thousands of protesters flooded nearby Tahrir Square and clashed with the police. They, in turn, fled. Halwagi says the chaos provided the perfect cover for the thieves and vandals who climbed onto the museum roof. "The looters were able to come down from this window with a cable, electric cable, and one of them [fell] down on this showcase and it was broken and he was injured," Halwagi says. "We found his blood on the floor. And it still remains on the artifacts." He pauses at another glass display case — one of 13 that had to be replaced, he says. "This showcase was broken," he says. "This is a new glass." He points to a painted wooden statue inside, one of King Tut astride a leopard. A second one is no longer there, he says. "I think they thought that this was gold," he says. "Because it's gilded wood." Frustrated, the thieves smashed it, then continued their search for gold and jewelry inside the museum, Halwagi says. They got none, he adds, because those items were locked behind iron gates the thieves couldn't break through. Halwagi says the broken statue is being restored in the museum's laboratory. He adds that a teenage protester brought back a 16-inch limestone statue that he found lying outside in Tahrir Square. During the unrest, civilian volunteers who feared for the museum formed a human cordon around the building, despite the risks of being in the volatile square, says Fayza Haikal, a professor of Egyptology at the American University in Cairo. "The people, the citizens, organized themselves to protect their antiquities ... and this was not only [at the] Cairo museum but in many places in Egypt it happened," Haikal says. 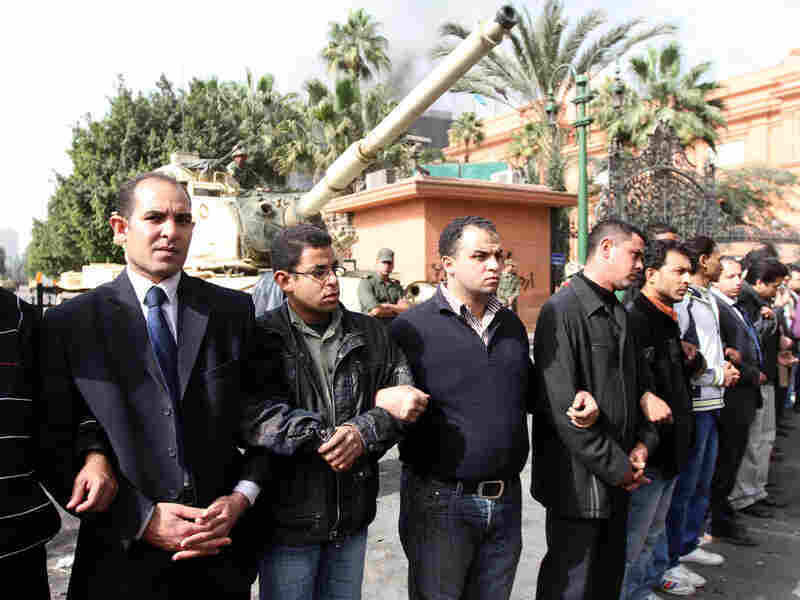 The Egyptian military also stepped in, taking over law enforcement, and eventually, the leadership of the country. But Haikal and others say there simply weren't enough soldiers to protect all of Egypt's antiquities and sites. Even with the police returning, experts complain that looting continues, especially from storerooms at Egypt's many remote ancient monuments and digs. Egypt's antiquities chief quit in protest over the transitional government's failure to address the issue. Another top official, museum Director Tarek al-Awadi, says he drafted a petition signed by thousands of archaeologists worldwide who are demanding that the Egyptian government make protecting the country's historical sites and antiquities a top priority. "This heritage should be protected by everyone in Egypt and outside Egypt because this is for the whole world," he says. "It's the heritage of mankind." A team from the United Nations Educational, Scientific and Cultural Organization is reported to be in Egypt this week to assess the damage and offer help.